It’s really easy to take lights for granted. So much so that even some preppers forget that during a power outage, you need more than just flashlights. Sure, they’ll help you find your way around the house, but you also need a light that fills the room so you can work, or read, or see the faces of your loved ones. There are plenty of options, but if you find yourself in a power outage and you don’t have any of those options, don’t worry. As you’ll see, almost every home has something that can be turned into a candle. Candles are the easiest lights to synthesize in an emergency situation. Some of them even double for cooking and heating purposes. But before you get started, remember to use non-flammable containers, set them on a non-flammable surface, and never leave a burning candle unattended. You’ll also need to know a little about wicks. Almost anything that will pull wax or oil into the candle flame can be used as a wick. Strips of cotton from socks or a T-shirt can work, or even a strand from a mop. Whatever you decide to use, make sure it’s cotton or linen, not polyester as the poly will melt in the flame and won’t draw up the oil or wax. Always pre-prime your wicks with melted wax before making the candle, as it will help with the burn quality. For an oil lamp, soak your wick for a bit before lighting the lamp, and make sure your wick is not too far out of the oil. Now on to the list. This fat burns best as a liquid or warmed oil. It does not hold up well to molding, though a shallow dish and wick would probably work. The simplest method is shown in the video below. Just cut a stick of butter in half, then take a small square of toilet paper, fold it diagonally, and roll it up to make a wick. Now make a hole in the butter with a toothpick, and use the toothpick to push your wick into place. Rub some butter on the wick and light it. It should burn for about 4 hours. Dropping a wick into a jar of Crisco shortening can provide a candle that burns for 24-30 hours or more depending on the size of the tin. To get your wick to the bottom of the Crisco can, use a straight stick (such as a skewer) to make a hole that goes down to the bottom of the can. Olive oil, canola oil, and coconut oil can be used if you have an oil lamp or a wick holder for an oil-based light. A simple wire wick holder is easy to create out of a paper clip. Just unbend half to create the bottom, bend the other half up, and add a twist to hold the wick above the level of the oil. Another option is to make a lamp out of an aluminum can, as shown in the video below. You can also make an oil lamp out of an orange. It just takes a bit of careful peeling. Cut through the skin around the circumference of your orange, and carefully work the skin loose around the flesh of the orange. Free the central pith on one side, so that it can draw through on the other. The pith is your wick. Put oil in the half-orange on the side with the pith, and light. If you are cooking greasy meat such as bacon or hamburger, you can turn that grease into a candle. Just pour it into a jar around a cotton fiber wick, let it cool, then light it. The grease candle should burn as long as a comparable sized paraffin candle. This is similar to a lard candle, though bacon grease is a softer substance so it needs a non-flammable container like a glass jar. Any type of meat or fish canned in oil can also be used as a temporary light source. Use a hammer and a clean nail to knock a small hole into the lid of the can. Stuff the wick into the can and let it soak for a few minutes before lighting it. The wick will draw the oil out of the can to power the flame without harming the food inside. It is recommended that you fully cook the canned meat before consuming it, as the flame would preheat it a bit. Any oil-canned meat that you use for a light should be consumed the same day. A sardine tin, when combined with a suitable wick, can also work well as a temporary oil lamp. With this one, you can eat the fish first. Find a short cotton wick and soak it in the oil. Once it’s soaked, wrap it in a strip of aluminum foil, but leave at least half an inch exposed. Light the wick, and place it on the edge of the can, as shown in the video below. Cheese wax, either taken off cheese or a block of wax, can also be formed into candles. You can mold candles in paper cups, or even in a hollow in sand. Just make sure you have a way to secure the wick in the bottom of the mold and a way to hold it in the center of the candle. Cheese wax can clog wicks if you blow out the candle, so make small candles that will be burned in one sitting. Crayons can be melted down and molded to make emergency candles. Alternatively, they can also be burned on their own, without being melted down, and don’t need a wick. Just use a lighter to heat up the bottom of the crayon, then stick it on a plate or in something non-flammable like an Altoids tin. One crayon can burn for 30 minutes. 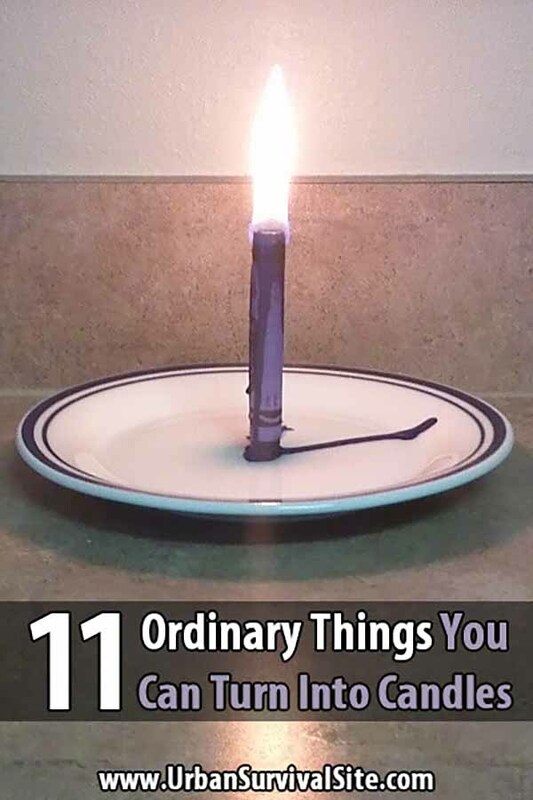 This is probably the easiest candle to make. Those ubiquitous tubs of Vaseline can be a fine emergency light source. Drop a wick into one of those and you will have a candle for several hours. Alternatively, spread some Vaseline on a piece of cotton, then place it in a non-flammable container and light it. Candles with multiple wicks can work well for heating and cooking. One good cooking candle is also very simple to make. It just takes a short tin can, old candle wax, and cardboard. Use a clean can, such as a tuna can, and cut the cardboard to be the same height as the can with the little furrows upright in the can. Coil the cardboard into the can as tight as you can pack it without squishing the cardboard’s channels. Now pour melted wax into the can until all the little cardboard channels are full. To use this candle, simply light it on fire. If you have a grill or small burner, you can place it under it for cooking. The cardboard in this candle acts as the wick and gives you a large burning surface for heating or cooking. If you want to stink up your house why not comb Longhair Kitty and just set the extra cat hair on fire? It would smell about the same and the cat would enjoy everything until you set the comb on fire, then you won’t see him the rest of the day.